*This is part one of a two-part story on assistant coach Isaac Chew. Part one focuses on Chew’s recruiting, while part two will look at Chew’s path that led him to Marquette. When Tony Benford accepted the head coaching position at North Texas on Apr. 24, it left Marquette in a bind for more reasons than Buzz Williams losing his top assistant of four years. Benford recruited Chicago, a pipeline Marquette has used often to bring in top players from the neighboring city oozing with talent. So when the time came for Williams to fill Benford’s role as assistant coach, one reason Illinois assistant Isaac Chew was the right choice was his ties to the Windy City. The Chicago native grew up playing basketball on the West side, but never considered coaching growing up. Chew has family in Chicago and, though his coaching career began and flourished in Kansas City, he has kept a close eye on Chicago talent and has connections in the city he has already begun using in his stint at Marquette. And while the Marquette campus doesn’t have the state affiliation the Illini do, a place Chew spent six weeks after a year under Frank Haith at Missouri, Chew is finding that more players are understanding the proximity Marquette has to Chicago, a short, hour-and-a-half drive, and is using it in the recruiting process. Recent Marquette recruits from Chicago have included Dwyane Wade, Todd Townsend, Jerel McNeal, Maurice Acker, and more recently Reggie Smith and incoming freshman Steve Taylor. And with Chew’s addition, Marquette should continue to have the inside track on some of the top name’s from every class in Chicago that Benford and Williams have built to this point. Chew fed multiple players to local Missouri as a rising AAU coach in Kansas City, and built lasting relationships on the circuit before being hired by Billy Kennedy at Murray State, where he spent four years from 2007 to 2011. He knows the benefit of using the recruiting ties he has gained for more than a decade, specifically Kansas City and Chicago. Chew fills a need for Marquette in his ability to recruit 90 miles south of Milwaukee, but he was also a perfect fit to coach under good friend Buzz Williams because what he looks for in a recruit is what Williams built Marquette on the last five classes. While he plays to his coaching relationships and recruiting ties, searching for the best player available still comes first for Chew. Last year’s Murray State team that won 31 games that Chew helped recruit had just one player from in-state Kentucky; All-American Isaiah Canaan is from Mississippi, OVC Defensive Player of the Year Donte Poole is from Las Vegas and second team All-OVC Ivan Aska from Florida. Chew has been hot on the recruiting trail since he was hired by Williams in late May, but his first major event will be at Marquette Madness on Oct. 12, when the coaching staff will bring in recruits on both unofficial and official visits. Chew said the effects can differentiate based on where a prospect is in the process, but is important nonetheless. “If a player chooses to come for Marquette Madness, that’s great for us no matter the class,” Chew said. “But I think it’s all about the timing and where he is with his process. Some guys, you want to come because they’re new to the process and you want them around to see the atmosphere and how we do things in special times. We want them around because they’re close to the decision-making process. “The key to recruiting is what the best atmosphere for a young man and his parents to be around that will allow him the best experience. It’s all about each individual and where they are,” he added. Multiple players from Chicago are expected to be in attendance, and of those players, there are sure to be Williams’ favorites: switchables. In his five recruiting classes, Williams and the coaching staff have transformed a roster from undersized, speedy guards to a more complete, balanced roster growing in height each year. The roster consists less of specific positions and more athletes who can play different positions. That, Chew said, has given him more freedom on the recruiting trail. 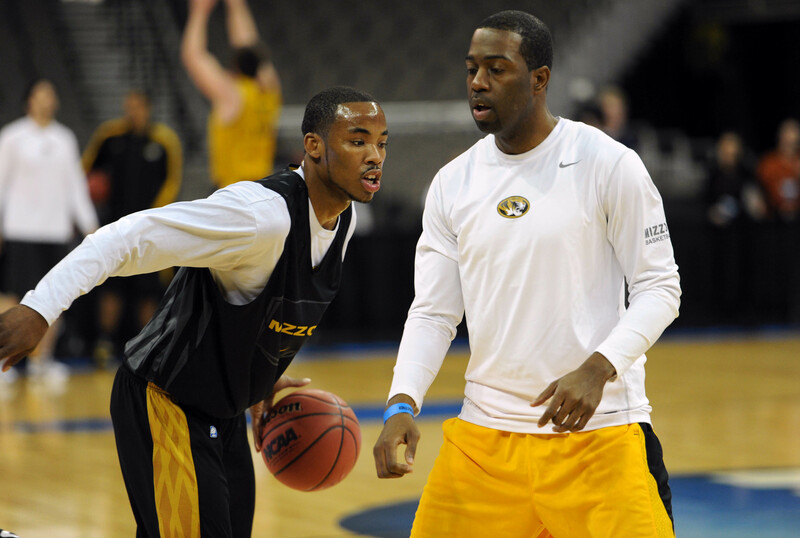 One player who fit that bill for both Marquette and then-Missouri assistant Chew was Taylor. The incoming Marquette forward was recruited by the Golden Eagles and, later in his process, Haith and Missouri. While Chew, Taylor’s lead recruiter for the Tigers, was late on recruiting the Simeon star, he understood why Marquette was the ultimate destination. And while Chew is unable to comment on unsigned commitments, 2013 point guard Duane Wilson considered Missouri before choosing Marquette. There’s a good chance Chew was hard on the trail during Wilson’s recruitment. So just as he did with Murray State and Missouri, Chew plans to help build future Marquette recruiting classes on the same foundation of athleticism and discipline he saw while watching Williams’ program from afar, whether the kids were from Chicago or not.